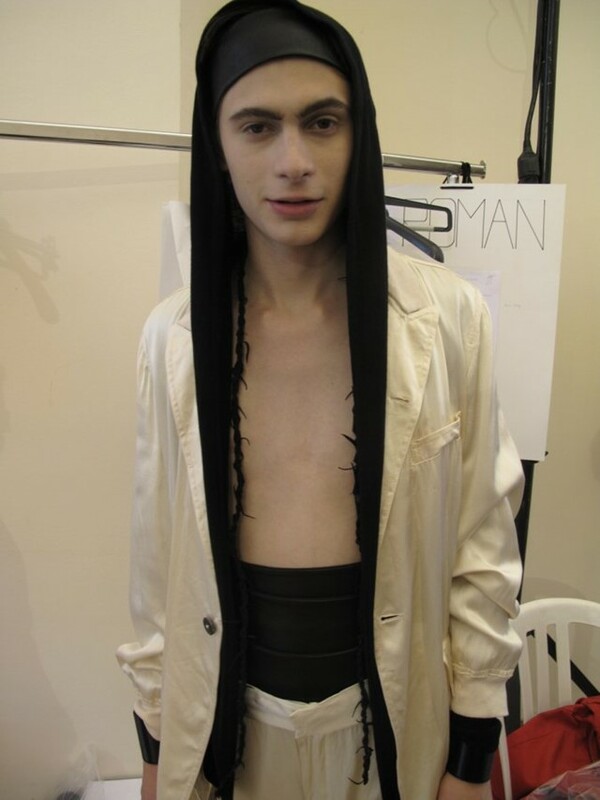 Backstage film and photography from the show and we speak to Demeulemeester about second skin clothing. In the early afternoon on Saturday, half way through this edition of Paris menswear week, droves of fashionable and in-the-know people travelled to Metro Trocadero and walked the short journey to Musee de l’Homme. The occasion was another installment in Ann Demeulemeester’s fashion empire; her spring summer 10 menswear show. The air was thick with excitement, people gasped for air – a combination of great clothes and extreme heat! What we saw was an exercise in perfection. Even from a distance one could tell that Ann’s fabrics – like her structured suit fabrics – were beautifully made, and finely detailed, as her tuxedo jackets with sequined lapels proved. Colour wise there was lots of skin-toned beige, quite literally as well. Many Demeulemeester models came out showing their chest, but it all blended in and made sense with her aesthetic vision. And it wasn’t just jacket lapels that had been decorated with sequins; sleeveless tops, and even cardigans, came out covered in the shimmering detail. The classic Demeulemeester tailoring was of course present; loose-fitted jackets in white and black, low cut leather waistcoats, and cropped trousers. Dazed Digital: What are the main feelings running through the collection? Ann Demeulemeester: It’s an intriguing dialogue between the body and the garment, a sensitive balance of sensuality and strength, of tenderness and power. It’s also about enlightenment and innocence, but an innocence that is almost provocative in its innocence. DD: How did that transform into the clothing? Ann Demeulemeester: The clothes work as a second skin, There is a lot of naked skin in the show, but the nakedness works with the clothes and that’s the dialogue between the body and the garment! DD: There are some beautifully light colours in the collection! Ann Demeulemeester: Yes, I have light beige colours inspired by skin and the enlightenment led me to white and light blue. But there is also black in there. It’s very important that there is strength in the collection as well, and it comes in the shape of black leather! DD: So it’s about using opposites? Ann Demeulemeester: Yes, opposites and tension, but it’s very delicate – it’s a fine line! This time around I really wanted to concentrate on the garments, voluntarily I made it much more pure. Ann Demeulemeester: It’s about sensuality and the way I think a man can be very sensual without losing his masculinity. DD: Which piece is your favourite from this collection? Ann Demeulemeester: But you can’t just have one piece, you would be naked. No, I can’t choose – they’re all my children, don’t make me choose between them! Backstage photography by Giovanni di Nunzio.